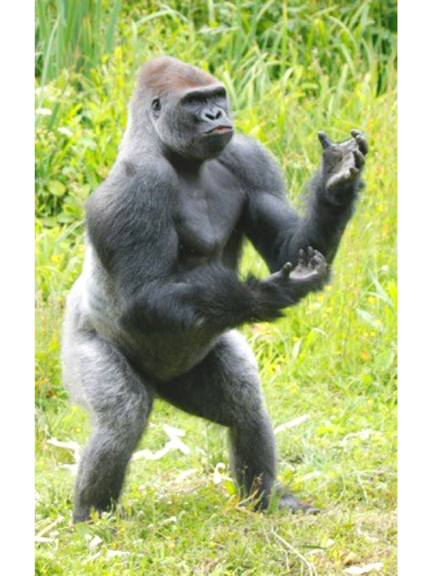 These photos show Paignton Zoo’s Western lowland gorilla Kiondo apparently in the middle of a Shakespearian soliloquy. Kiondo, who is 13 and weighs 186 kilos, came to Paignton Zoo from Stuttgart Zoo in 2006; he was born on 11th October 2002. “Is this a carrot I see before me?” “Out, out damn spud.” "Two beans, or not two beans." "Now is the winter veg of our discontent." "A horse radish, a horse radish! My kingdom for a horse radish!" The charity’s bachelor group of Western lowland gorillas – a Critically Endangered species - plays a vital role in international gorilla conservation, providing somewhere for young males to grow up in a social environment. Some may move on to be the dominant males in bachelor or family groups in other collections as part of the European breeding programme. Paignton Zoo Environmental Park is a registered charity. For more information go to www.paigntonzoo.org.uk or ring 01803 697500.